Choose Size... Small Medium Large X-Large 2X-Large ($20.00) 3X-Large ($22.00) Please choose the Size. Measurements are across the chest at the bottom of the sleeves (W) and from the neck to the bottom hem (L). Do you have any other questions about our Thor's Hammer T-Shirt? Love the shirt made well too. Thanks! I'm wearing this right now! This is a nice, heavyweight material, true to size if not a tad large. All of the Elder Futhark runes are represented here. Once again, item shipped very quickly, and the customer service is always impeccable. Hair Thor! The little rating moons didn't seem to want to stay selected for me, but I give this 5 moons! Very comfortable shirt and I love displaying my heritage and interests. I'm never disappointed with Gryphon's Moon, I love this store! :) Thanks! Great quality product and super fast service :-). 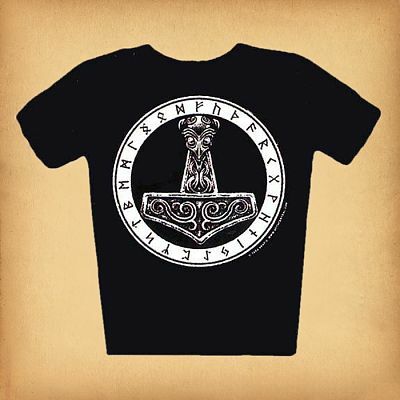 All the Asatru I know will be green with envy of my new very cool t-shirt. Superbly detailed Thor's Hammer, photographic quality. Nice fit on my handsome husband!